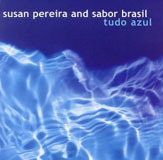 Led by vocalist/pianist/percussionist Susan Pereira, the group Sabor Brasil offers a debut album with the addition of guests including guitarist Romero Lubambo, harmonicist Hendricks Meurkens and trumpeter Claudio Roditi. Founded in 1991 by Pereira and her husband, drummer Vanderlei Pereira, Sabor Brasil has been making itself known at New York clubs like 55 Bar, Zinc and Birdlandvenues that shed light on many new and exciting jazz acts. Prior to working with this group, Pereira had built a deep resume in Manhattan with some of the city's leading Latin and Brazilian players. Tudo Azuloffers a lengthy listen to an exciting band. Much of the music is written by Pereira, but the program also consists of music from Antonio Carlos Jobim and Milton Nascimento. The pace is generally up-tempo, with Pereira singing in fluent Portuguese and, in one instance, a bilingual version of Nascimento's "Nado Sera Como Antes." Pereira sings the up-tempo numbers with a hard edge and offers up the Brazilian vocalese that would be expected from a native ensemble. Jobim's "O Morro Nao Tem Vez" (the same song that was used in the 1959 film Black Orpheus), is a hard-hitting samba, while "Feiteo de Oracao" is a refreshing follow-up in the best tradition of lyrical bossa nova, featuring Pereira's lilting vocals and beautiful guitar work from Lubambo. Bird calls evocatively begin a Pereira's piano and flute-driven instrumental, "Baiao da Chuva," while the mid-1960s pop hit, "Our Day Will Come," is sung in English with a slight Latin patina and feels out of place on the album. A haunting, 12-minute "Na Baixa do Sapateiro" concludes the album, sounding a great deal like "Bahia." The music is enhanced by the presence of the guests, as well as trombonist Luis Bonilla; Tudo Azul will certainly encourage fans to check out the group in performance. Track Listing: West End P.A. ; O Morro Nao Tem Vez; Feitio de Oracao; Baiao de Chuva; Nada Sera Como Antes; Tudo Azul; Maracakim; Our Day Will Come; Ascensao; Na Baixa do Sapateiro. Personnel: Susan Pereira: vocals, piano, percussion; Louis Bonilla: trombone; Dario Eskenazi: piano; Laura Dreyer: alto and soprano sax, flute, alto flute; Mark Lambert: electric guitar; Kip Reed: bass; Leo Traversa, Itaiguara: bass; Scott Kettner: percussion; Joe Cardello: percussion; Philip Galinsky: percussion; Vanderlei Pereira: drums, percussion; Marco Figueira: background vocals; Mark Lambert: background vocals; Kerry Linder: background vocals; Analu Pereira: background vocals; Susana Ribeiro: background vocals; Rob Blumenthal: background vocals; Napua Davoy: background vocals; Jenny Hill: background vocals; Todd Isler: background vocals; Itaiguara, Marianni: background vocals; Vanderlei Pereira: background vocals; John Romagnoli: background vocals; Devorah Segall: background vocals; Luiz Simas: background vocals. Guests: Romero Lubambo: acoustic guitar; Claudio Roditi: trumpet; Hendrik Meurkens: harmonica.